I read a lot of blogs. I figure, if I’m not making something, I should be reading about making something. Sometimes one leads to the other, as was the case when I was lying in bed reading and I came across Mr. X Stitch’s “Tiny Things” swap recap (part 1, part 2) and announcement for the “Blinded by Science” swap. I got out of bed, revamped my plushies Flickr account, and signed up. I’ve been hungry for community, for collaboration, and for inspiration, and this swap provided all of these wonderful art-making things. I’ll probably post another links round-up when all of the swap pieces have been posted and the swap round-up has gone up on Mr. X Stitch. I’m so excited about the work so far, and I can’t wait to see the rest of the pieces! As the swap coordinator Olisa (CocoaEyes on Flickr) described it, this is a “forward trade. Meaning that you will make a minimum of ONE piece to send to another participant, and you will receive from someone else.” I received a piece from Lizzibabe that I love and which will be an awesome start to my at-home inspiration wall (to rival the one in my office and to be in league with that of Love & A Sandwich). But even more importantly, we live in the same town! We met up for coffee and stitching, and we plan to do so again soon. What an amazing world. 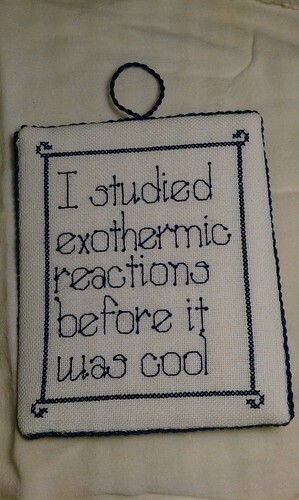 Hipster Science, a photo by Lizzibabe on Flickr. 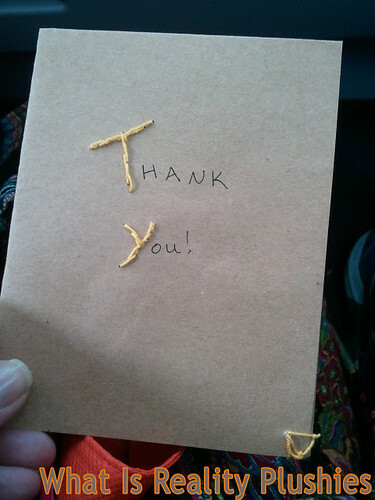 As always, I’m more excited to give a gift than to receive one, so I made this little thank you card for Lizzibabe. It’s my first go at paper embroidery. I didn’t poke enough holes, but the wacky stitch is good enough for me, and hearing about the wacky process was good enough for Sarah. I have been hand-sewing at a slower pace lately, so I was really excited to have a new project. 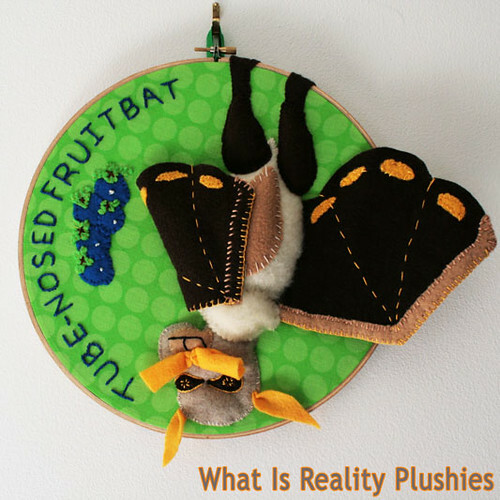 I went all-out on this tube-nosed fruit bat hoop for xsilverdaisyx who blogged about it here. I love the phrase “Batty Goodness.” Accurate. Mad had mentioned when we were discussing the swap parameters that she enjoys when new species are discovered and they seem like they should be aliens. I remembered reading about a bunch of “new” and “weird” species being “discovered” in 2010 in Papua, New Guinea (I’m sorry for the air quotes; I can’t turn off the voice pointing out the colonialism in all of this). I started looking for an inspiration creature, and I found this little mash-up of a guy at National Geographic. I thought it was a mountain lion or an ape at first. I used that photo and this one with the berries to piece together my version. This is a 10″ hoop, and I used a cotton remnant for the backing, floss for the lettering, and polyester felt (including my precious fuzzy felt) and cotton crochet thread for the bat and the berries. I put washi tape around the hoop edge, backed the hoop with tan felt, and then I used one of my fantastic new wooden tags from The Plaid Barn, since I can’t use my cloth tags on Flickr (they list my etsy shop!). 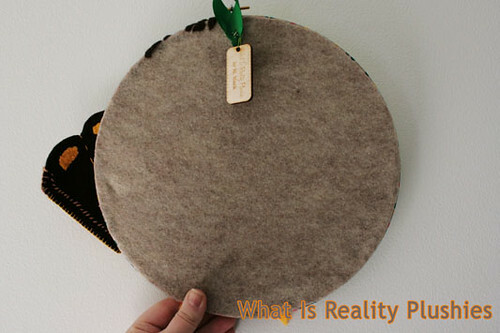 Most importantly–First crafts blog post! This is batshit crazy! (Haw haw). 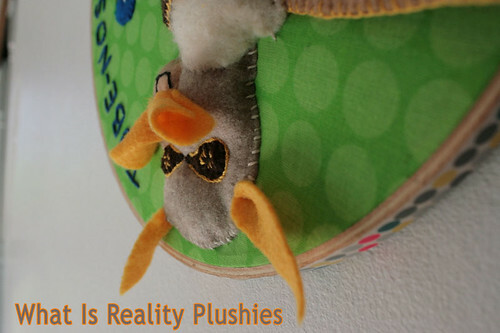 I love this bat-ling so much – it’s amazing how nature creates such crazy beasts, and your felty guy is just gorgeous. Hahahaha, good one. Thank you so much! Beautiful work! I look forward to another crafty night! Thanks! I look forward as well! I know I already commented on teh FBs, but srsly m’dear – this piece is SO fantastic. And it was great to hear more about the process and all those firsts!! Thanks for the bloggy feedback! I figured, what better time to jump in? I had lots to say. WONDERFUL, wonderful work! Wow. I’m blow away! I can’t wait to see what you’re fabulous mind comes up with next. Thank you so much for the kind words! This swap and connecting with folks has been so good for me. Thank you for everything you do! I’m having so much fun seeing your process photos and new projects.